Lazy Man’s Chocolate Chip Bar Cookies Recipe: Just 4 Ingredients! Lazy Man's Chocolate Chip Bar Cookies Recipe: Just 4 Ingredients! This Lazy Man’s Chocolate Chip Bar Cookies recipe is so amazing. It’s the ultimate way to bake cookies using cake mix! 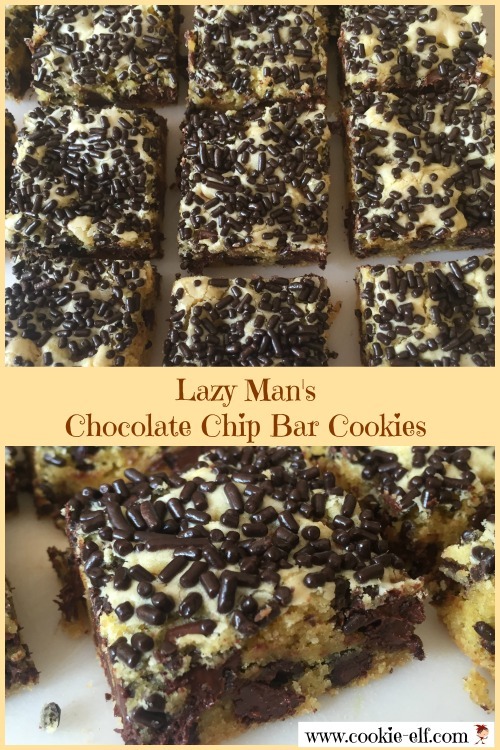 You may see similar recipes called “Lazy Cookies” or “Lazy Bars” floating around … and it’s easy to see why. The cookies taste great, like a soft-textured chocolate chip cookie, but in a bar. But they are so, so, SO easy. Dump 4 ingredients together with a spoon and plop the whole bit into the oven. It’s so quick and mess-free – a perfect treat to make at the last minute. And you probably already have all the ingredients in your cupboard, too. Preheat oven to 350º F. Spray a 13 x 9 baking pan with vegetable spray. Or line the pan with aluminum foil, allowing ends of foil to extend over two sides of the pan. Coat the foil lightly with non-stick cooking spray. Cube the butter, set it in a microwave-safe bowl, and cover it with waxed paper. Cook on high at 10-15 second intervals until butter is melted, stirring after each interval. Pour melted butter into a medium mixing bowl. Whisk in eggs. Add cake mix. Use a large mixing spoon to combine the ingredients together until cake mix is absorbed. Fold in chocolate chips, mixing only until they are distributed evenly. The dough will be thick. Drop dollops of cookie dough into the prepared baking pan. Use an angled spatula (also called an offset spatula) to spread the dough evenly in the pan. Sprinkle the cookie surface with chocolate sprinkles (optional). Bake the bars for 18-20 minutes. Do not over bake the bars. Remove bars from the oven just as the edges begin to turn golden, before the cookie surface or edges begin to brown. The bars retain heat and continue to set after they are removed from the oven. Grasp ends of aluminum foil and lift the bars from the pan. Set bars on a cutting board. Peel away foil. Use a sharp knife to cut cookies into 5 rows by 7 rows (or any other size you wish.) Remove bars from the pan with a spatula. You can replace the yellow cake mix with a white cake mix. You can make thicker bars in an 8 x 8 baking pan or a 9 x 9 baking pan. Follow the directions above, but bake cookies for 25-28 minutes rather than 18-20 minutes. See more Bar Cookie Recipes on our Pinterest board.